Girl children of slums and streets are the most vulnerable amongst the poorest of poor children. While boys in the same environment are often led astray by the allure of anti social earnings, the girls wind up being the prey of antisocials. Their need for a protected and secure environment is imperative. It is an unfortunate fact of this downtrodden level of society that slum and street males are prone to abandon their families leaving the single mother to fend for the rearing and care of their infants. In the absence of family male protection, the children become exposed to the worst elements of slum and street life. The single mother very often has to choose between going out to earn a living and leaving small children uncared for and unprotected OR staying at “home” and protecting the child but facing starvation. In any event the children are trapped in a vicious cycle of inherited poverty, without access to education and skills development that could have helped them make a future for themselves. Calcutta Social Project runs its Shelter Homes and Day Care centres on two bases. For the most vulnerable among the children living in a dangerous environment: a 24 hour Residential Shelter Home. For those in a comparatively less dangerous environment : a Day Care facility that permits the single mother to deposit the child with CSP early in the day, after which CSP feeds, cares for, educates the children in schools, and at day end enables the mother to collect her child back and take him/her home. Thereby the mother has the option of earning a living while her child is fed, protected, cared for, and sent to school. Calcutta Social Project runs two Shelter Homes and Day Care facilities, one for boys and one for girls. While the Directorate of Social Welfare, Govt of India funds the Boys Shelter the Girls Shelter Home is as yet without such support. An Application has been submitted for support to the Girls Shelter Home and the inspections have been made, but there is a minimum of 6 months lead time for sanctions to materialise. CSP seeks support from donors to finance the running of the Girls Shelter Home and Day Care in the interim 6 months. There are 25 Girls in the Shelter Home on a 24 hour residential basis and 20 Day Care girl children whose breakfast, lunch, education and extra-curricular activities have to be funded. The Girls Shelter home and Day Care have been running for many years now but absence of dedicated and dependable donors is the cause of stringency. The Home operates with Government recognition under a license issued by the Department of Social Welfare. The recognition does not entail Government financial support. It runs as a refuge for orphans and children deserted by parents and other variants of neglected/abandoned children or children in danger of abuse while single parent mothers are out earning a living. CSP undertakes the responsibility for these children and provides them food, clothing and day and night care and enrolment in educational and vocational programmes according to age and ability. Day care centre at 114a, Motilal Nehru road is a vital support to the single working BPL mother with school going children. The day care centre facilitates working mothers to place their primary school going children in the 5-11 age group in a secure environment. These school going children, who have nobody to look after them at their home before and after school hours, are kept as day boarders with attendants and provided with breakfast, lunch and afternoon snacks and, most importantly, education. To provide adequate Nutrition , Hygiene and HealthCare to such children . To provide and monitor Primary education to such children and thereafter High School education upto Board level by mainstreaming them into the educational process. To facilitate vocational openings for children who are not academically strong, by way of Girls Craft centre for tailoring, Tie ups with hospitals for Nursing training, Beauty salon courses, over and above what is at their disposal in Computer education. To enable the deprived single mother a chance to earn an honest living without compromising the safety and security of her girl child. To give the child a normal and holistic childhood ,as middle class children have, by way of excursions, picnics, cultural activities, sports and games so that deprived children do not have a deprived childhood. Calcutta Social Project provides all services to beneficiaries completely free of cost including Computer Education. Mamoni Dandapat a girl who just gave her class 12 finals in 2016 comes from a broken family where her parents stay separate. Her mother sent her to the Calcutta Social Project Girls Home to keep her alcoholic father away from her. Mamoni aspires to be a teacher and we at CSP know she will be excellent at it. Growing up without any siblings, Mamoni has turned into the elder sister of the Girls Home. Caring yet strict, she is extremely well behaved. Mamoni Dandapat is an elegant dancer and an exceptional elocutionist. She has performed on several Calcutta Social Project functions and occasions. As she prepares herself to pursue her further education in college, Calcutta Social Project is going to stand by her side to make her dreams come true. 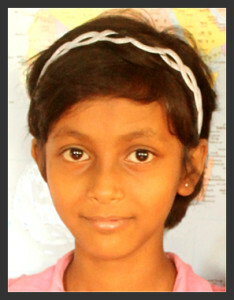 Susmita Mondal is a quiet and small girl who lives in the CSP Girls Home. Hard working in studies she is usually the soft spoken one with one of the most well behaved attitudes. She has one younger brother who is also in CSP. Her father being no more, her mother is too poor to keep any of the children. She is a maid servant but finds it very difficult to keep working as parts of her body on the left is paralysed. In the need of proper nutrition and care due to lack of financial support and space at home she joined the Calcutta Social Project Girls’ Home. 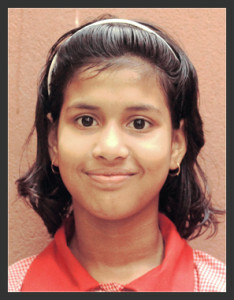 Susmita Mondal came 3rd in class 7 of Murlidhar Girls High School and is now successfully studying in class 8. She loves to read books, dance and play with her friends. One of the brightest students of Calcutta Social Project, we are harnessing every skill Susmita has to make her an exceptional teacher when she grows up. Experiencing a broken family and the death of her father Munmun was first a day care student at Calcutta Social Project. Her mother works as a maid and lives in someone elses house in Kolkata so she can support her daughter. While her brother and father used to live together, her brother now lives with extended family in Siliguri. Today she is a student at the Girls’ Home and she is a good student in Murlidhar Girls High School. Studying in class 8 now, she scored the 6th rank in class 7. 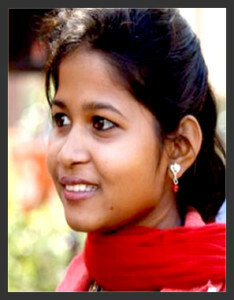 Munmun Barman aspires to be a teacher like her close friend Susmita Mondal. She is a very lively girl who is very fond of dancing and drawing. Exceptionally well natured, Calcutta Social Project is always standing by Munmun’s side so that she can grow up and make her mother proud.